So without getting into too many details and ruining the surprise for those of us who still have a month to wait...is the game awesome for those of us who like both Zelda and Musou games? People seem to be praising the game. I've been enjoying it heavily. I'd like to say I can't wait for this update, but I have so much to do in adventure mode I probably won't touch challenge mode for a while. I wish they'd get to work on selling the Zelda costumes (eShop version only came with Link's costume set), and make one or two for Lana while they're at it. yes it does, looks awesome. 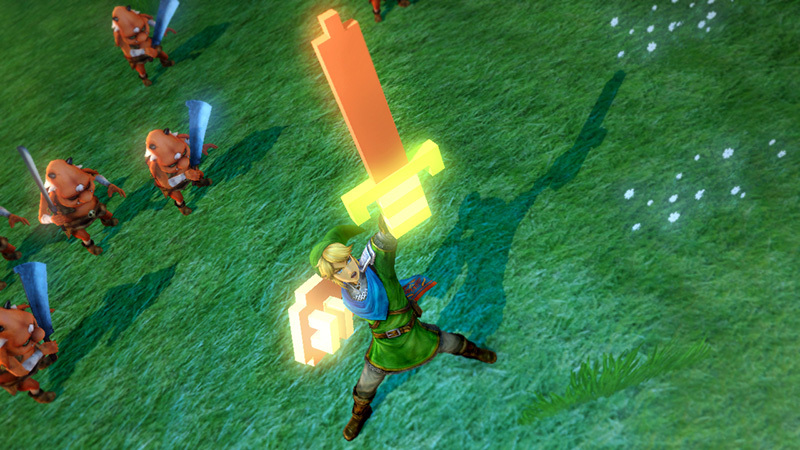 That sword may be the coolest thing ever seen since the Mario Kart 8 DLC. Err... are they teasing a new character for the next update (not 1.2.0)? Can someone please translate? From what I understand, they're asking whether players would like it if the update included a new character. It's just an hypothesis, they say. 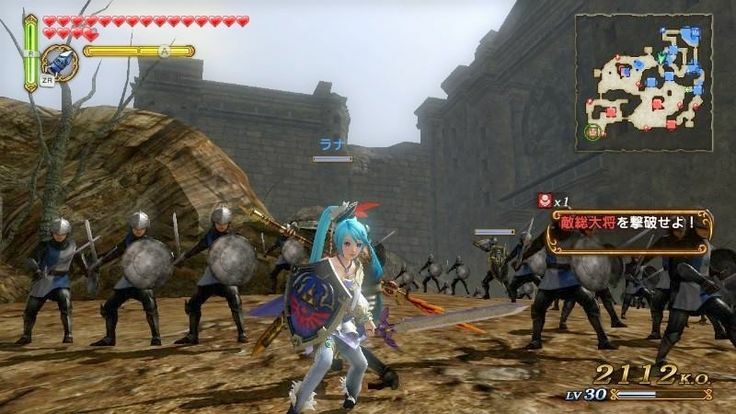 The Hyrule Warriors version 1.2.0 update is scheduled to be available on September 1st. After that, on a bigger update (and this is only an example!) -- an example of this sort of update would be, if say "the addition of another playable character," who would you like to be added? So you're telling me...there's a chance? Nothing said about the "wrong weapon character" glitch being fixed... I hope that makes it to America. I so doubt that it will, but it looked fantastic. I need playable Valga please. Whoops, got the version number wrong yesterday, thanks for pointing it out. Sword is a Minecraft reference. Lol. And Cia and Wizro. But woul also like to see someone from the Zelda universe too. Looks like the update has gone live! Who is the playable character? 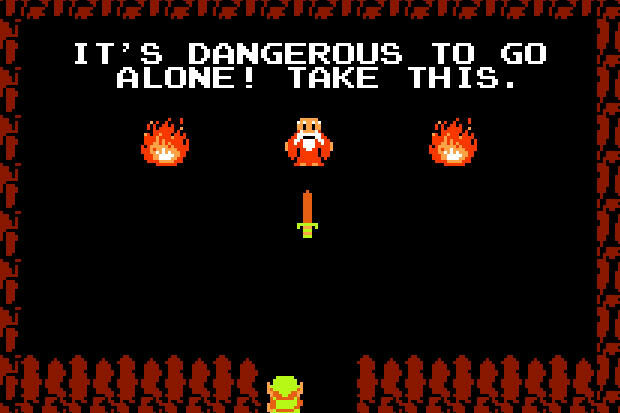 Link with a NES Sword. Pretty sure next update after this one will have a new character. Anyone know the update file size? That might offer clues on if anything significant besides the challenge mode, sword, bug fixes, and BGM select were added. Any chance this will be on the disk for the US version, or is it too close to release? Guaranteed to be on disc at launch I would assume. If not, immediate update. Last week, Nintendo confirmed it would be a Day 1 update. 1.1.0 should be on disk, though. I'm going to guess and say Demise. Highly doubt it. I think the 3 Koei original villains take precedence. And that Ganondorf can probably fill for Demise just fine. Looks like I'm maxing out Ruto first then. I was going to do this anyways. the only sword we ever needed. Let me predict a Miiverse post: "look at this minecraft sword i got lel"
Already got that on the first page of this thrwad lmfao. The update is 68/69MB. Just about to try it. EDIT 1: First screen explains the patch (as well as the known stuff, is also mentions "other bug fixes", so the weapon bug might be in there), before giving you the "Sword" (280 power) which is classed as a new rank within the single-handed sword weapon class. EDIT 2: Played the challenge mission. It's only one, but there are 3 missions within it (500 in 5 minutes, 300 with special attacks in 5 minutes, 3 enemies). Really easy though, for something called challenge mode. If you fail one of the missions (I failed the 300 with special attacks one) you still carry on anyway. I hope future challenge missions are, well, challenging. Well it was free. Some games would have charged so it is great we are getting it. Is the character model glitch still in? Not only animation, but now entiere movesets and weapons are switched. Read this on Z-U, never experienced myself those bugs, though. Haha, I still love it. Yeah, that's good. Might as well, make it a feature in the game. From the looks of it, they'll keep adding new quests every week or so (I doubt they went and create a new mode just to have 1 lone mission). Guess we'll see soon enough. Note that the next update will maybe add a new character (that's not new). It will also have the awesome feature that allow you to push the home button on the title screen (yeah, but it's annoying). Outside Groose*, the female Link as shown in the concept art seems to be asked by the fans. Personally, I want female Link for a long time now, but I prefere her to come from Nintendo/Aonuma's core team. I fear "Linkle" (it seems people call her that) will not be appreciated enough if it comes from Tecmo Koei, even with Aonuma's greenlight. * Even if I'm in #TeamTingle, Groose is in the best spot to appears. HW features content from OoT, SS and TP. OoT gets many characters but Sheik, Zelda and Impa are from the "regular" Hyrule in HW. So OoT gets Darunia and Ruto for support, and we can say Ganon for foe. TP gets Midna and Agitha for support, and Zant as foe. SS gets Ghirahim as foe, and Fi as support. One supporting character less! And if that's not enough, one of the SS level feature the bombing the emprisoned thing in SS... without Groose so far. Sorry if already discussed, it only appears to me now. Finally, I don't understand the poitn of the challenge, but I cleared it anyway. Going back to the adventure mode now, that thing is massive! That sword might be the best thing ever. Why do I have to wait to the 26th? Ugh I wish this game was out now in the US. We're so close ladies and gentlemen.